Set in the heart of this popular and thriving village community with its public house, church and school a brand new three storey family home offering contemporary, energy efficient, family accommodation with its own garden and garage THE PROPERTY is brand new built to exacting standards by a local developer. Throughout there is an attention to detail not often found in new build at this level including Cat 5 wiring, plugs incorporating USB sockets, wiring for an alarm, both Oak flooring to the downstairs, the bathroom and shower room and carpeting elsewhere, quality tiles and sanitary ware, UPVC fascia, soffits and external window cills, block paved driveway and so on. A front door with canopied entrance porch leads into an entrance hall with the main living area being straight ahead which is a fantastic space being triple aspect and open plan with doors facing south opening up onto the patio and garden. The kitchen is comprehensively fitted with a range wall, floor and drawer units with soft close hinges and associated work surfacing. Appliances include built in fridge/freezer, dish washer, four ring gas hob, with electric oven under and extractor and light above. Rounding off the accommodation is stylish cloakroom with wc and wash hand basin with monobloc tap and a utility cupboard having space for a washing machine with work top above. Stairs run from the entrance hall to the first floor where there are two double bedrooms and a very stylish family bathroom with a Roca steel enamel panelled bath with independent Grohe shower over, close coupled wc., wash hand basin with vanity drawers under and monobloc tap, part tiled, heated towel rail and oak flooring. 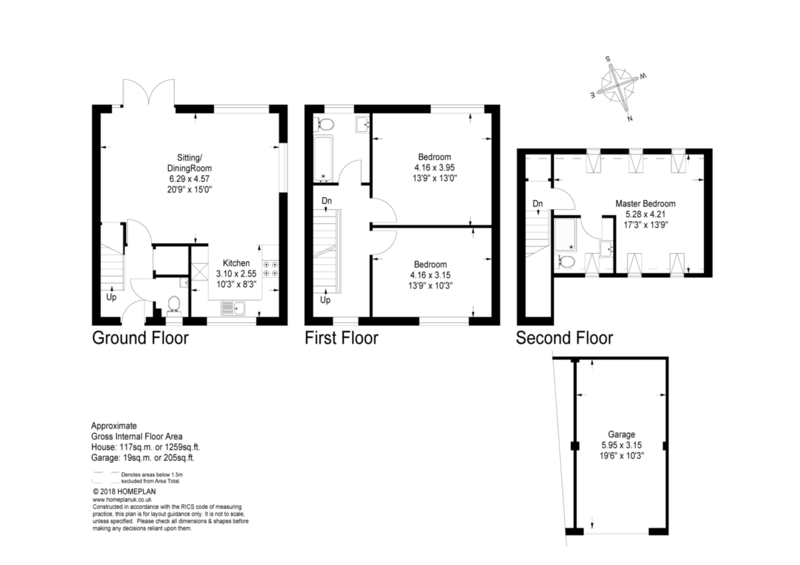 The top floor is given over to the double aspect master bedroom with built in cupboard and a fabulous en suite shower room with a wash hand basin with vanity drawers under, close couple wc., tiled shower cubicle with glass screen and Grohe shower, chrome heated towel rail and oak floor. OUTSIDE The garage is the right hand one of a pair approached initially up a shared tarmacadam drive leading to a block paver turning area. The garage has power and light laid on and ample roof storage. Within is a capped off soil stack which if ever utilised would need to be connected to the drains. GARDENS The rear garden is small but perfectly formed with a terrace to enjoy outside entertaining whilst overlooking lawn edged by both brick walling and fencing.